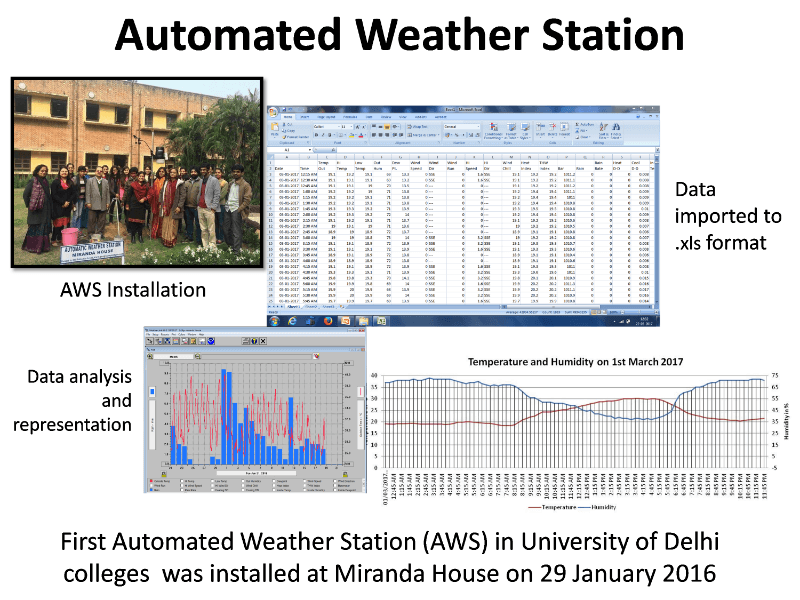 Miranda House installed an Automatic Weather Station (AWS) on 29 January 2016; it is the first college of University of Delhi to have this facility. The Davis AWS is a wireless set up which is a Vantage Pro 2 professional weather station with a weather link software data logger. It has an integrated sensor suite and gives data in the NOAA format. This is a huge step forward in the scientific collection of real time weather data in the college. Training Workshops: METKIDS Programme (Geography and You in collaboration with IRIS Publication and Indian Meteorological Society) aims to prepare students to observe climate patterns and precipitation measurements and providing them an opportunity to learn about meteorological principles, forecasting methods and advanced observing techniques such as Radar and Satellite. The METKIDS Programme had two sessions, the winter and the monsoon session in February and September 2016, respectively. First and Second year students of Geography honours course participated. Resource persons were drawn from the Indian Meteorological Department (IMD). They addressed many aspects of data interpretation and weather forecasting. The AWS gives data on ambient pressure, rainfall and temperature. The wind speed and humidity are also recorded. Students were introduced to the working of the weather station, all its parts and how to access the data using the application Weather Link Mobile. This enables capturing data from the AWS anytime they want. Students were also introduced to earth's atmosphere and various phenomenons in the atmosphere. Retd. Air Vice Marshall Mr. Ajit Tyagi gave talks on how data is coded and interpreted in the IMD. Coding and decoding of IMD data was also taught to the students. Between the winter and monsoon session, the students were divided into five groups and were given topics to make presentations on. The topics were: heat wave, cold wave, urban heat island, diurnal variation in temperature and thunderstorm. The METKIDS programme resumed in September with the monsoon session. The main objective of this session was to give the students a chance to present their projects so that they could be evaluated. 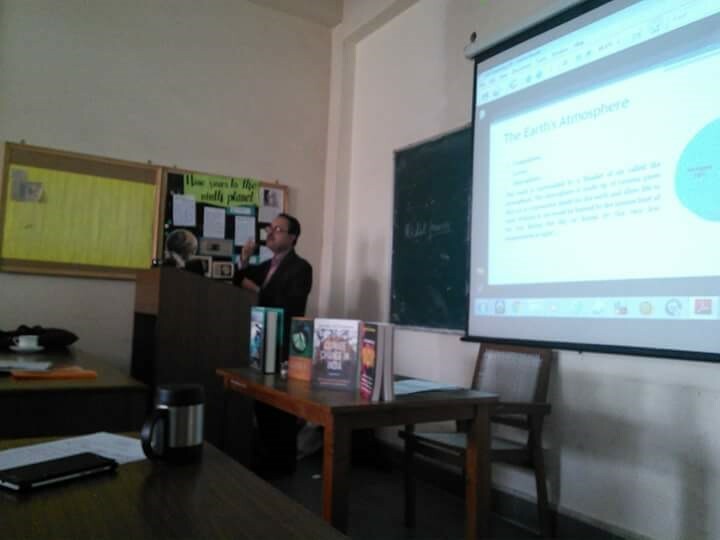 Lectures were given on Indian monsoon and tropical cyclones. Mr. Ajit Tyagi was there to evaluate the presentations. The students presented quality project with many convincing points. 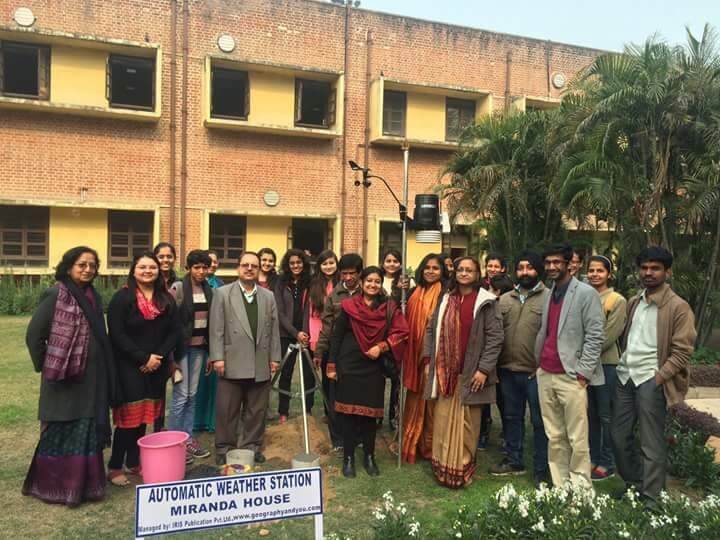 This was an innovative and enriching way of studying Climatology concepts.